At first I thought, this is easy to answer, and on some level it really is. Shooting from the hip I would say that the education at Alan D is second to none I truly believe this to be the case, however I think that there is also a much deeper answer to this fairly simple question. I have thought about this a lot. Not only do Alan, Edward and the rest of the academy teach the underlining principles and fundamentals of hairdressing, they also set the infrastructure for a fruitful industry career for those I have sent there to be taught. There seems to be a synergy which quite frankly I have never seen between an academy/college and salon. I find the relationship between Alan D & Frank Di Lusso hair almost symbiotic. Working in unison to reinforce the correct way to be a hairdresser whether is the practical side of cutting hair and the numerous technical skills to be learnt, the theory of hairdressing which is chemistry, biology & physics but also the social aspect of working on the shop floor and being decent human beings. Alan D help me to shape the future of the industry, creating hairdressers that function In the real world and in my salon. They have the best chance of running a full column and working their way up to senior staff. 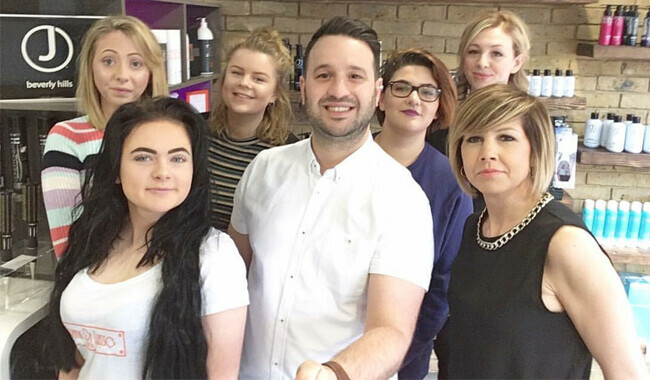 In three years of running my own salon, five of my staff have graduated at Alan D, one of which is my manager and the busiest hairdresser in the Sutton. It seems as I write this that the question was not easy to answer at all. Ultimately I love my industry. That’s why I send my assistants to Alan and why I will always do so.